I love the simplicity of this card. 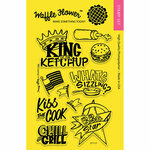 Waffle Flower BBQ Saying stamp set was perfect for this cue card. I wanted to make people feel warm when then look at the simple watercoloring behind the sentiment. The watercoloring was created with a Tombow Dual Brush Marker – 847 Crimson. I swipe the marker on a piece of plastic, sprayed a little bit of water on the plastic and used the plastic to add the color in the corner of the cardstock. Once the watercolor dried, I used Versafine Onyx Black Ink to stamp the sentiment on top of the watercolor. To finish the card off, I used We R Memory Keepers Tab Punch Board to round the corners. What a fun card!! Love the CAS design! This card is beautiful in its simplicity. Love it! The design, the sentiment, the coloring… Great job! Wow, Kymona! I love the simplicity of this card but it packs a big punch! 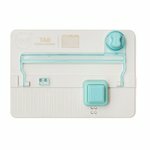 I have to try this inking technique…great when you want to use a stamp with no coloring involved!